Nov. 24 and Dec. 1, 8, 15 and 22. 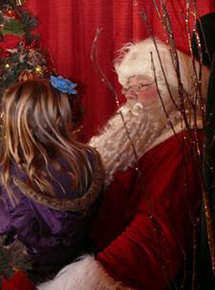 Children and parents can visit with Santa Claus on the five Saturdays before Christmas at Santa's Village. Hours are from 9 am to 12 p.m. on Nov. 24 and Dec. 1, 8, 15 and 22. Santa's Village is located at 17139 Kercheval Ave., next to Village Palm and Focus 313 Eyecare. There is no fee to visit Santa. Families are invited to take their own photos. Children also can make holiday cards that will go to the pediatric patients at St. John Hospital. Santa's Helpers also will collect donations of arts and crafts materials, toys, stuffed animals and board games that will go to the Pediatric Activities Room at Ascension St. John Children's Hospital. Santa's Village decor is provided by Bishop Design & Display.